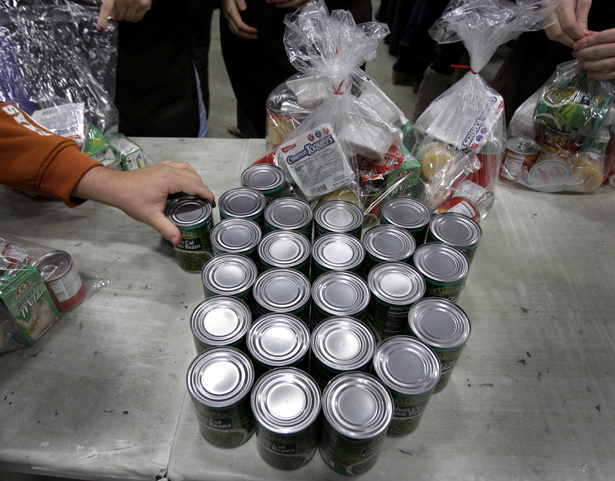 There are 50 million Americans struggling with hunger—and with sequestration, things will get worse. In his State of the Union address, President Obama offered the kind of concrete proposals that anti-poverty advocates have long been waiting for: raising the minimum wage, expanding high-quality early childhood education and creating new “ladders of opportunity” in twenty of the poorest communities in the country. All of these policies would help reverse the spread of hunger, which now affects more than 50 million Americans, including more than one in five children—an increase of 37 percent in childhood hunger since 1999. However, these promising proposals aren’t nearly enough, especially since the country is poised to move in the wrong direction in the fight against hunger. If the sequester cuts takes effect, 600,000 low-income pregnant women and children up to age 5 will be cut from the Women, Infants & Children (WIC) program, which currently provides them with a monthly package of nutritious food. SNAP (food stamp) benefits are also scheduled to be cut in order to pay for—if you can believe it—a 2010 deal that improved the nutritional quality of school lunches. After November 1, SNAP benefits will average approximately $1.30 per person per meal. Finally, during the last Congress, both the House Agricultural Committee and the full Senate voted to cut the SNAP program—by $16 billion and $4.5 billion, respectively—so more cuts might be on the horizon. That’s why a new report from Joel Berg, executive director of the New York City Coalition Against Hunger (NYCCAH) and a Senior Fellow at the Center for American Progress, is so timely. How President Obama Can Reverse America’s Worsening Hunger Metrics is a practical guide to executive actions Obama can take now “to significantly reduce child hunger, as well as US hunger in general,” according to Berg. In 2008, then-candidate Obama pledged to end childhood hunger by 2015. This report offers ways he can move in that direction without relying on Congress. Berg is a man who knows this subject. He has served as executive director of NYCCAH since 2001, helping it grow into one of the leading direct service and advocacy organizations on hunger and poverty in the nation, and was a political appointee in the US Department of Agriculture during the Clinton administration. Berg helped start AmeriCorps, and ran a program that mobilized 1,200 people to do anti-hunger work, rural economic development, and environmental work. He created the first-ever federal initiative to help faith-based and other nonprofit groups fight hunger and help low-income Americans move out of poverty. He also coordinated the USDA’s effort to help community groups increase the amount of food they recovered, gleaned, and distributed to hungry Americans. “My biggest regret when I left the government was that I had finally figured out how the place worked after eight years,” Berg jokes. Indeed, two of his key recommendations to Obama involve executive orders that would direct federal agencies to work together to create “food jobs” such as food-processing businesses; and for the agencies to work with the USDA to increase the participation of eligible children, seniors, people with disabilities, veterans and working families in nutrition programs like SNAP, WIC, home-delivered meals for seniors, and school breakfasts and summer meals. While directing agencies to work together seems pretty straightforward, Berg notes that “it’s fairly rare for federal agencies to work together in this way—even within a department.” For example, he describes his effort at the USDA to coordinate its work with farmers markets: one division allotted resources to WIC and the senior farmers market programs; another gave money for the creation of new farmers markets; another researched farmers markets; and others dealt directly with the farmers who sold produce at the farmers markets. Berg notes throughout the report that ultimately the solution to poverty and hunger is a Congress and president pursuing a full employment economy with jobs that pay a living wage. But that’s clearly not going to happen in this political environment. “My top ideology is effectiveness—getting something done we couldn’t ordinarily get done because we are pushing for it,” says Berg. So his recommendation to create food jobs is key in that regard: Berg urges Obama to sign an executive order directing the USDA, Small Business Administration, Department of Commerce, Department of Labor, Department of the Interior and Corporation for National and Community Service to work together to create food-related jobs and provide the job training and placement services necessary to ensure that low-income Americans obtain and keep those jobs. The challenge is figuring out how to scale these businesses up and make them attractive to private investment. For example, New York City public schools serve 4.5 million meals per week. There is significant summer vegetable production in New Jersey and some in the Hudson River Valley. This produce is sometimes shipped across the country for processing and then sold back to New York City public schools. “Why not instead have a local facility for cleaning, washing, and packaging vegetables for New York City public schools? There could be similar efforts to can, freeze, and process foods in urban centers throughout America,” says Berg. He cites Detroit, San Francisco, Los Angeles and cities in Texas and Florida as other places with proximity to major agricultural production where these kinds of facilities would make sense. Other food jobs could be created through businesses that turn raw produce into ready-to-eat salads, salad dressings, sandwiches and other products; or companies that sell healthy food and beverage vending-machines; as well as restaurants and catering businesses that offer affordable and nutritious food. Berg also calls for a bipartisan White House Conference on Hunger, either as a stand-alone event or as part of a broader summit on poverty, to launch new effective anti-hunger efforts. Berg says the kinds of commitments that could be elicited include: corporations increasing food donations and helping with outreach to people who are eligible for SNAP, summer meals and other federal nutrition programs; corporations working with organized labor to increase wages and the availability of healthier foods; employees doing skills-based service—for example, an accounting firm offering its services pro bono to food pantries and soup kitchens; and supermarket chains locating new stores in low-income neighborhoods. “There are many mainstream corporations that progressives don’t agree with on most issues, but they would agree with them on this, and it’s important to bring them to the table,” says Berg. He believes that organizing people together to fight hunger is an effective way to begin to address broader poverty-related issues. “I’ve always seen fighting hunger as a way of fighting poverty—an entrée into the poverty debate,” says Berg. One of the great disappointments for anti-hunger and anti-poverty advocates during President Obama’s first term was that he never produced a plan to end childhood hunger as he had promised to do as a candidate. But it’s not too late. Whether Congress would go along with such a plan isn’t the point. Showing the American people how we could get this done if we wanted to is the point. In his report, Berg offers the president actions he could take—with or without Congress—to demonstrate a real commitment to ending hunger in America. TANF is such a lousy program, why not just end it and replace it by offering the unemployed a wage-paying [subsidized] Transitional Job (TJ)? The overwhelming majority of TANF recipients are unemployed adults. If, instead of receiving small dollops of cash, they had the opportunity to work in a Transitional Job (TJ) at the minimum wage—up to forty hours per week if they are totally unemployed, or a smaller number of hours per week if they have part-time employment so that their total work week is 40 hours—it would be a vast improvement. [Participants] would make more money. Their wages would also help them qualify for Social Security and Medicare. More important, their earnings would also help them qualify (if they have children) for the federal EITC, any state EITC, and the federal Child Tax Credit. As a result of their combined earnings and these tax credits, they’d be more likely to get out of poverty. It is true that some TANF recipients have such a serious disability that—though they may not qualify for SSI—they will have trouble working or working enough hours in a typical job. Also, some TANF recipients will have just had babies, or have young children to care for, making typical work a challenge. The solution is to replace TANF with a Transitional Jobs program that is sensitive to the limitations faced by persons with a disability, a new baby, or the responsibility of raising pre-school children, and enables them, too, to perform enough TJ work to earn wages [that] lift them out of poverty. TANF has proven a failure. We should replace it by offering the unemployed poor what they really want, and what makes most sense for them and society: the opportunity to work in an accessible, wage-paying Transitional Job until they can find regular, unsubsidized employment. Maria Gomez, president and CEO of Mary’s Center and friend of This Week in Poverty, was awarded the 2012 Presidential Citizens Medal, the nation’s second-highest civilian honor. In 1988, Gomez founded Mary’s Center in Washington, DC, as a clinic to provide prenatal and postpartum care to Latino women in an impoverished neighborhood. There are now seven sites, a federally qualified health center (FQHC) that reaches 24,000 individuals, including mental health and dental services; a senior center; two mobile units providing dental, maternal and pediatric healthcare; home visiting, early intervention for special needs kids and WIC; literacy, computer and language classes; tutoring, afterschool and mentorship programs on site; and a summer employment program in which teens work in Mary’s Center or local businesses. Congrats, Maria. And thank you and Mary’s Center for your incredible work. “To Thrive, Minneapolis Children Need a Place to Call Home,” Children’s HealthWatch. As home prices in the Twin Cities rebound and foreclosures roll on, an increasing number of families are housing insecure—that is, forced to move frequently, living in overcrowded units, or behind on rent. This study finds that two-thirds of low-income children live in families experiencing housing insecurity, putting them at greater risk for developmental delays and other health issues. Compared to securely housed children, their families find themselves at more of a crossroads with energy security, household food security, child food security and quality healthcare. What can policy-makers do? For one, expand access to quality affordable housing. “Investing in Our Children: A Plan to Expand Access to Preschool and Child Care,” Cynthia G. Brown et al., Center for American Progress. Despite an uptick in preschool enrollment nationwide, the most disadvantaged children are the least likely to enroll. Meanwhile, only 22 percent of low-income families have access to federally subsidized childcare. Researchers offer a variety of proposals to fill the gap. First, the federal government should match state preschool expenditures up to $10,000 per child per year. Preschool would be free for children with family incomes below 200 percent of the poverty line (about $36,000 for a family of three), and would range from 30 to 95 percent of the cost for those above that threshold, on a sliding scale. Second, the government should increase access to child care, raise the federal childcare subsidy and require states to adopt standards of care. “TANF Child-Only Cases: Who Are They? What Policies Affect Them? What Is Being Done?” Jane Mauldon, Richard Speiglman, Christina Sogar and Matt Stagner. While the majority of funding from the Temporary Assistance to Needy Families (TANF) program, goes to families, some goes solely to children. This report parses out the challenges that different categories of needy children face in obtaining federal benefits: children living in the homes of relatives (or non-parent caregiver cases); children whose parents receive Supplemental Security Income (SSI); and US-born children whose parents are undocumented immigrants. The report argues that federal and state governments do a poor job at tracking these cases, disaggregating data, and providing necessary information and services to qualified children. One suggested reform is that the federal government track each of these categories separately. “Developmental Education: A Barrier to a Postsecondary Credential for Millions of Americans,” MDRC. With a 40 percent share of all college students, community colleges are vital for preparing a huge population of Americans for the workforce. At least two-thirds of these students, however, don’t earn a certificate or degree within five years of enrollment. Resolving the crisis in part involves improving developmental (or remedial) education. There are a variety of promising avenues for doing so: investing resources in comprehensive programs and away from unproven short-term reforms like single-semester learning communities; moving students through remedial education at a faster rate; and improving remedial education instruction.